In honor of the two-year anniversary of my Antarctic odyssey and its tremendous emotional impact on me, I’d like to repost some older entries. If you’re a new follower, I hope you enjoy. Let’s explore – our minds and our world. It’s a bit tricky to jog on a treadmill on the deck of a moving ship. The pitch, the roll, your stride, your rhythm. You have to anticipate, to compensate as your foot lands short when the deck pitches upward, or extend your stride when the ship pitches down into the troughs. I’m not talking about those massive cruise ships with their massive stabilizers. I’ve never been on one and, quite frankly, have no desire to ever go cruising with 4000 of my closest friends. My preference is for smaller vessels, which usually advertise themselves as eco-cruisers or expedition ships, like the 367-foot long, 148 passenger National Geographic Explorer. The Explorer, too, has stabilizers of course, but the ship is small enough for you to feel the ocean, to connect with it in a way impossible on big ships. That may not always be a good thing – barf bags anyone? But when the swells are just right, it’s like being rocked to sleep in a hammock while the slap of the waves against the hull, the faint hum of the engines, and the cries of the trailing seabirds become your background music. But there’s no closing your eyes, losing yourself in any music, when jogging on this treadmill. (Yes, I like to jog with my eyes closed. That’s why you’ll find me inside on a treadmill and not outside, bothered by those pesky worries about running into traffic…or off a cliff.) But even when safely ensconced on a treadmill, there are times when I won’t, or can’t, close my eyes. Sailing alongside the Antarctic Peninsula is one of them. If there was ever a vote taken for best jogging scenery, I think Antarctica would win. Imagine yourself up on the Explorer’s Wellness Deck, just below the Bridge Deck, your feet rising and falling with the ship as it runs through the waves, gliding past dark, jagged peaks coated in striated patterns of snow scarred by avalanches. I dare you to close your eyes. I only wish I had discovered this joy sooner than halfway through the trip. As I wrote in an earlier posting “Healing Through Horror” I’d been very upset by leaving behind my terminally ill cat, Turtle, and it took me many days to recover my emotional stability, to truly revel in this adventure I had embarked upon. But finally in the darkness of my cabin one night a tiny voice came to me telling me that Turtle was still alive despite my certainty that she had already passed. I dared not admit to that hope – lest I be disappointed upon returning home. But it was enough of a spark to get me up early the next morning, grab my iPod, and get on that treadmill. 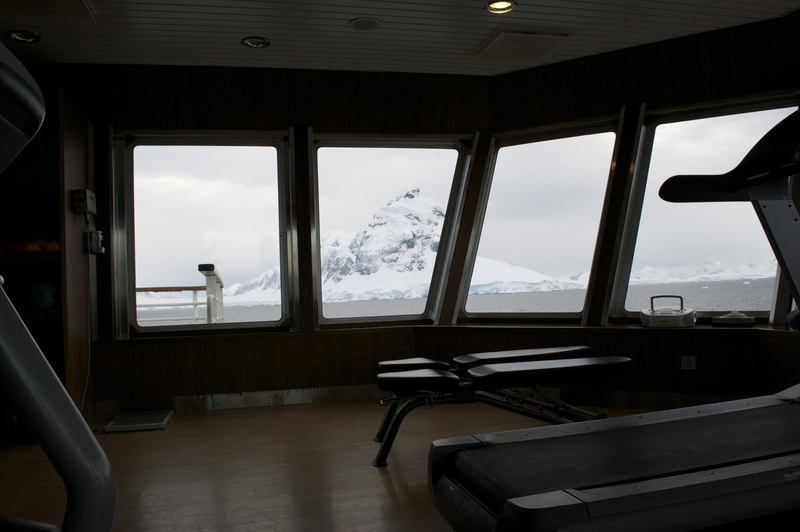 There to discover the joy I had been missing: music in my ears, Antarctica outside the window. Despite the turmoil of my emotions, I found myself running to the rhythm of the waves, kicking my heels back, with a smile spreading across my face. It became a carefully choreographed dance between my feet, the ship, and the waves. A trio of partners intertwined. It may sound strange to many, but my favorite music genre is movie soundtracks. (I still remember the odd looks that admission earned me during a lunch time conversation with co-workers years ago.) There is no better music when it comes to motivating you to pick up your pace. No, flowery rom-com theme music won’t quite cut it; heroic action scores – that’s the thing. And think of the irony of blasting the theme song from “Hawaii Five-O” while sailing past giant tabular icebergs ten times the size of your ship. Still, that morning, the music – its daring, hero-infused notes – couldn’t have been more contradictory when it came to the scenery: Star Trek , scored by Michael Giacchino. But maybe not. What could seem as alien, as far away as outer space to the average person? Antarctica. More importantly, it fit my soaring mood. Give the full soundtrack a listen. Especially the End Credits. See if that rise, the way the music crescendoes at the 4.5” mark, doesn’t make your feet faster, your breath quicker. All the while surrounded by a myriad of seabirds: albatrosses, petrels, gulls, fulmars, and shearwaters, who fly past the windows, wheeling and diving, dancing – like you – with the joy of freedom in Antarctica.